We used to think that adult - and leader - development stopped in early adulthood. It doesn’t. Not only can we continue grow in experience, knowledge and skill during adulthood (horizontal development), we can also transform how we see and relate to the world (vertical development). By knowing the predictable stages of vertical growth you can assess your current capability as a leader, and what the next steps in your development might be. You can also discover whether the complexity of your thinking is sufficient for you to provide the leadership demanded of you! The Synergist leads the way in creating a sustainable future for humanity and the planet. Leadership flexibility and choice is least at the Conformer level and most at the Synergist level. Leaders need to grow up! One of the most important insights into the nature of leadership of the past 20 years - one that remarkably few leaders are aware of - is that a major factor in leadership effectiveness is the leadership stage you operate from. These stages, like the stages of childhood development, are travelled through in sequence. And like the stages of childhood development, one stage is not better than another, just different. Each subsequent stage includes and builds on the qualities of each earlier stage. As you can see from the descriptions of each of the stages, people operating from the later stages see reality in more nuanced ways, are more sophisticated in how they engage with their inner worlds, and have more options for action. Thus, for anyone seeking to lead an organisation in the increasingly ambiguous, complex and fast moving environment we find ourselves in, operating from a later stage may give an advantage over someone else operating from a earlier stage. But the key criterion is whether the demands of the leader's role are matched by the leader's stage of development. Each of the stages is summarised below, and the journey through the stages is shown in the diagram. The percentages show the proportion of leaders estimated to be operating from each of the stages. Alternative names for some of the stages are shown in brackets. For a person at the Conformer stage it is others who define what is valuable, not oneself. The Conformer will behave so as to fit in to work and social groups, meets others' standards, behave correctly, and maintain face and status. Conformers can therefore be tactful, loyal, respectful, but may also find it difficult to deal with conflict, give or receive criticism or take unpopular decisions. Their ethical choices are strongly influenced by the views of family and people who are significant figures at work. answering the question "Do I belong?" providing a supportive work environment where conflict is avoided. Experts see other people's views as one factor affecting their own actions rather than virtually the only thing. What is important for the Expert is finding the one 'right' answer to the problem at hand. Whereas Conformers identify with what makes them the same as others in the group, Experts are more interested in what unique skills they have that enable them to stand out from the group - but they still define themselves in terms of the group. Their ethical choices are Absolutist - only one view is possible on a given ethical issue. answering the question "Who am I?" seeking to lead through controlling the world around them through the quality of their knowledge, intellect and expert ability. The Achiever's interest extends beyond their unique skills towards how to use these skills to achieve goals that will help the organisation (and themselves) be successful. Achievers are interested in other people's views, in working effectively with them, and in achieving results. Their overall goals and ethical framework, like those of the Conformer and Expert, are determined by the organisations to which they belong. That is, the authority that guides them is largely external. Their ethical choices are based on what the law and authority say is right. answering the question "Am I successful?" managing people efficiently and effectively to achieve work goals. 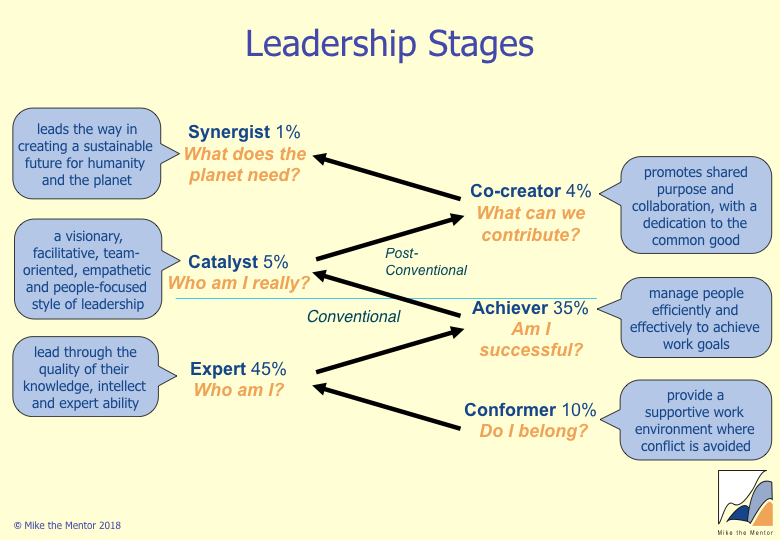 The Catalyst phase is the first stage of post-conventional Leadership Development. People at this stage are less interested in being a highly effective and productive component of the organisation and more in discovering what particular contribution they may be able to make. This stage involves an exploration of who they are, what their special and unique gifts are and also recognition of their limitations. The key personal transition they make is in moving the source of authority in their lives from being external to internal - it is this key shift which makes this the start of a new phase of the leadership journey. Their ethical choices are Relativistic - they believe that many views are possible on a given ethical issue - and all are equally important. answering the question "Who am I really?" a democratic, facilitative, team-oriented, empathetic and people-focused style of leadership. As the Catalyst becomes clearer about who they are and what their unique qualities and skills are, they will tend to become somewhat bored with further personal exploration and their interest will begin to turn towards what they can do with the new levels of self-knowledge they have gained. And so, just as the Expert turned their attention out into the world to find ways to use their skills and stepped into the Achiever phase, so the Catalyst looks out into the world to find ways of using their gifts and uniqueness and steps into the Co-creator phase. Their ethical choices are based on personal conscience and a set of values to which they are clearly committed and which they can articulate. answering the question: What can we contribute together to make a difference? As the Co-creator's Imaginal skills develop and broaden, and become increasingly integrated with their interpersonal skills, a consciousness shift takes place and a systems perspective emerges. At this Synergist stage leaders act to promote quality of life internationally by influencing positive change relative to equality, conflict resolution, creative technology, and ecology. They form mutually beneficial relationships with employees, customers, suppliers, community, and wider society. Leaders at this level ensure that they balance the time they give to service with time set aside for intimacy and solitude. They are often involved with multiple organisations, both to maximise their effectiveness and to enrich their global perspective. Their ethical choices are informed by an awareness of the rights of all human beings, and of the more-than-human world. answering the question: What does the planet need? developing Systems skills including the ability to see all the parts of the system as they relate to the whole; plan and design change in systems - institutions, societies and bodies of knowledge - to maximise the growth of the individual parts; differentiate between personal, interpersonal and system needs; set priorities creatively in the face of internal and external pressures; and speak with clarity and be understood by people of differing educational levels, cultures and walks of life. recognising their role, and their organisation's role, in creating a sustainable future for humanity and the planet. Nelson Mandela exemplifies the Synergist leader. See his description of his journey through the stages taken from his extraordinary book Long Walk To Freedom . Reflect on which of these stages is your centre of gravity - the one from which you habitually respond. And recognise that we often self-assess ourselves as operating from at least one stage later than other people, and assessment instruments, do. Are you newly arrived in this stage, consolidating your presence there, or starting to outgrow the stage and getting ready to transform to the next? From where do you operate on a good day? And from where on a bad day? What are the activities in your life which particularly challenge you at the moment? These are likely to be on your learning edge. Use the stage descriptions above to identify the capacities you need to consolidate or develop. For example, if you are struggling to find the right answer in situations where there is contradictory, ambiguous information and no one right answer seems possible, it is likely your are making the transition from Expert to Achiever and that you need to focus more on what will work, rather than on what the 'right' answer is. If you are transitioning to a later stage, try thinking, feeling and acting as if you had already arrived at that next stage. The Seven Transformations of Leadership, David Rooke & Bill Torbert in the April 2005 Harvard Business Review (pp 67-76). Values Shift: A Guide to Personal and Organizational Transformation , Brian Hall. Leadership Agility: Five Levels of Mastery for Anticipating and Initiating Change , Bill Joiner & Stephen Josephs. The stage labels come from their framework (and those in brackets are where Rooke & Torberts labels differ). Spiral Dynamics: Mastering Values, Leadership and Change , Don Beck & Chris Cowan. Personal and Organisational Transformations: Through Action Inquiry, Dalmar Fisher, David Rooke & Bill Torbert.